Impressions in the child’s mind are formed based on what we see and hear in this world. 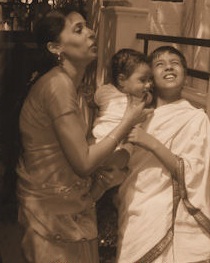 Nishkramana is the first outing of the child where it is shown good and auspicious symbols. This is usually done after the first month the child is born. The child is taken for a visit to the temple and shown the moon at night. The child is fully dressed and bejeweled and brought to the family deity in the house. Then the deity is worshipped with instrumental music. The guardians of eight directions, the sun, the moon, vasu devatas and the sky are all propitiated. Vedic scholars as well as family priest are fed and appropriate mantras are chanted. The child is carried out with sounds of conch shell (Sankha) and Vedic hymns are chanted. At the time of outing, the father repeats the Sakuntala hymn or the following verse, "Whether the child is conscious or unconscious, whether it is day or night, let all the gods led by Indra protect the child." Then the child is brought to the Pooja room or temple to perform the worship. The child is made to bow to the deity and the priest who in turn blesses the child for long life intelligence and health. After this the child is placed on the lap of the maternal uncle who brings it back home. The child is pampered with toys and other gifts with hearty blessings. Since the child is made up of five elements it is customary for the parents to propitiate these divine elements and seek blessings form them as the child gets exposed to them besides the main deities Sun and the Moon. O Child! At the Nishkramana ceremony may the earth and the whole world shower welfare and benevolence upon you! May the Sun shine brightly upon you! May your chest be filled with fresh life-giving air! May the divine waters quench your thirst! “Trayambakam Yajaamahe” and “asato maa sadgamaya” on this occasion. The Nishkramana ceremony aims at wishing the child a long and healthy life.